10.55 tonnes, 5/2.98/3.15m, one 88hp diesel, 26mph, 530 miles, 20-8mm armour, one 37mm firing HE and HP shells, one co-axial 20mm cannon and three 7.92mm LMG, 5 crew. This is a large 8x8 wheeled armoured car based on the C-2M33 but with a variant of the T-1M31 88hp diesel engine with a new transmission and a radio operator in the rear hull with a 7.92mm LMG covering the rear of the vehicle. Another LMG is bow mounted and the third is co-axial with the 37mm and 20mm guns. The provision of the 20mm Orkileon cannon is to give a weapon better suited to dealing with enemy armoured cars while the 37mm can be used for anti-tank work or support. The C-3 was developed from war experience operating the C-2 and the problems of the earlier truck conversions that were limited to road use. 60 ordered and all are in service. 3.82 tonnes, 4.2/1.97/2.73m, one 55hp diesel, 46mph, 417 miles, 10-5mm armour, one 20mm cannon and one 7.92mm LMG, 2 crew. 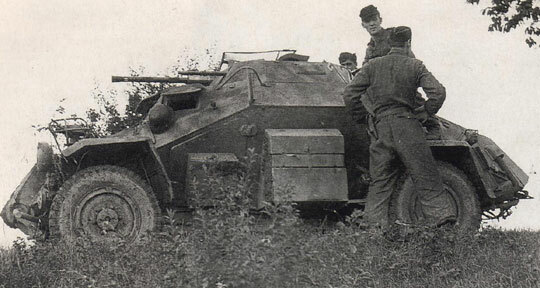 This small 4x4 armoured car was developed to replace the earlier van and truck chassis conversions and this car is designed for scouting with long endurance and small size to aid concealment while high speed aids escape and the 20mm Orkileon cannon provides adequate defence from enemy armoured cars. 60 were ordered in 1935 and another 60 in 1937. In 1939 another 35 were ordered. A total of 144 are in service with 11 in storage. 4.7 tonnes, 4.2/1.97/2.73m, one 55hp diesel, 37mph, 339 miles, 15-10mm armour, one 20mm cannon and one 7.92mm LMG, 2 crew. An improved C-4M35 design with thicker hull and turret armour. 60 were ordered in late 1942. A total of 60 are in service. 13.4 tonnes, 5/2.98/3.15m, one HAFDASA 150hp diesel, 35mph, 417 miles, 25-10mm armour, one 37mm firing HE and HP shells, one 13mm co-axial Browning HMG and two 7.92mm LMG, 5 crew. This is a large 8x8 wheeled armoured car is based on the C-3M35 but with a new 150hp HAFDASA diesel engine and thicker armour all-round and a new turret with 25mm armour on all surfaces. The provision for a 20mm Orkileon cannon has been removed. 60 were ordered in late 1941 and all are in service. 85 of these 6x6 armoured cars were ordered from Italy in 1945 to provide armoured reconnaissance units additional firepower for self-defence and to replace older heavy armoured cars. A total of 70 are planned for frontline service with 15 in reserve. 364 of this armoured infantry carriers were ordered in 1944 to provide armoured divisions with organic mobile infantry. A total of 243 are planned for frontline service with 121 in reserve. A variant of the CA-6 with two LR and two MR radios and one tank radio, one 7.92mm MG, 6 crew. 104 ordered in 1944, a total of 102 for frontline service with 2 in storage. A variant of the CA-6 armed with an Italian 57mm anti-tank rocket and one 7.92mm MG, 4 crew. 85 ordered in 1944. A total of 63 for frontline service with 22 in storage. Around seventy assorted 4x4 and 6x6 commercial trucks with 8-10mm armoured bodies and 1-3x 7.92mm LMG are used as scouts or personnel carriers. All were built by the Adolfo Bash firm of armoured car makers (normally for security firms and banks). Most of these now in reserve or with the Guardia Civil, with some used as improvised command vehicles or commanders' vehicles.